Today, your prospects are reading reviews of your business on on-line review sites, deciding what businesses they might want to deal with, and going directly to those sites, without ever doing a Google Search! Are you ready for this? 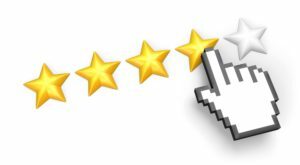 On-line reviews have been called “the village of the twenty-first century.” Why? Because on-line reviews are where people exchange their opinions about businesses, what they like and what they don’t like. It’s the social network equivalent of the old village square, a great place to find out about businesses you haven’t dealt with, and a great place to vent about an unpleasant experience. Today a growing number of your potential customers search on-line review sites to find companies who have lots of favorable reviews, then go directly to the Web sites of the companies of interest. They may select a business without ever doing a Web search! How Important are On-Line Reviews? There is good reasearch and numbers to back that up; see out page on the importance of on-line reviews. Unfortunately, we know that people who are unhappy tend to be more likely to share their views than people who are happy. There’s a real danger that your business’s reviews will appear to be worse than your actual performance with customers because of this tendency. Don’t let this happen to you! Instead, manage your reviews. You can do all this yourself, without any special tools. Our page on how to manage your reviews lays out just what to do. If you’re a small business owner, though, you’re busy! Do you want to spend an hour a day on the computer, working on reviews, searching review sites? Don’t you have more profitable uses for your time? Instead, spend your time developing your business, and let us do the routine work for you. There are a lot of review sites; keeping on top of your reviews on all these sites, and asking your customers to review you on the sites where you need more favorable reviews, and replying to reviews, is a big job. The good news for you is that it’s now possible to outsource this important work that brings you business. Dave’s Certified Reviews provides you effective review management at a cost you can afford that will let you conduct your review campaign in just a few moments per day. You’ll be in charge, you’ll know how well the program is working, and you’ll make the key decisions, but it won’t take a noticeable amount of your time. We do the work for you; you make the key decisions, that depend on your understanding of your business and your customers. All this, along with our (incredibly reasonable) pricing, sized for small businesses, is described on our page about plans and prices. While you read this, your prospects are reading on-line reviews about you and your competitors. If you’d like to do well in this competition, then the time to act is now. Just click here and we’ll contact you and get you started, with very little effort on your part.